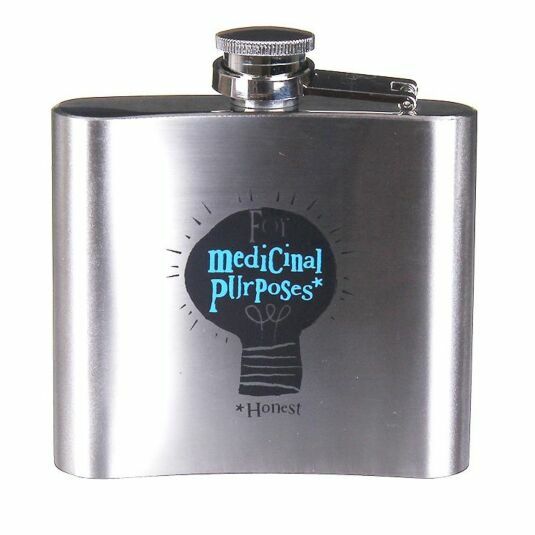 Enjoy a cheeky tipple of your favourite spirit to warm your bones on chilly winter nights or just as a pick-me-up on those long hard days in the most positive and bright ways with this ‘Man Booze’ Hip Flask from The Bright Side, offering that moment of refreshing relief when its needed the most throughout the day. This hip flask is great for filling with any spirit, be it whisky, bourbon or rum and will hold an ample enough amount to see you through any occasion. Fashioned into a large flask shape, this piece is decorated with a brushed stainless steel finish and adorned with a lightbulb illustration on the front and back of the flask. The front of the piece reads ‘Man Booze* to make everything seem like a good idea’ in a mixture of matt blue and black fonts, with the reverse reading ‘For Medicinal Purposes* Honest’. The hip flask is accessed through a screw top mechanism along the top of the piece, attached to a hinged arm to make sure you never lose it, no matter the amount you drink and is able to hold a maximum of 5oz of your favourite alcoholic or non-alcoholic beverages! 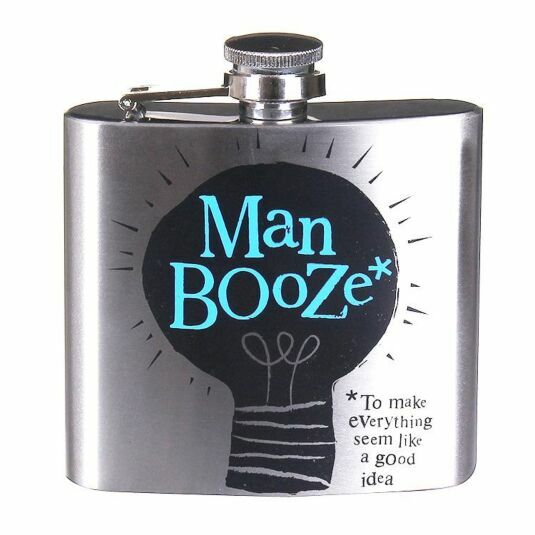 This flask would make a great gift as it comes beautifully presented in a Bright Side gift box, adorned with blue and white colour scheme and detailed with lightbulbs and witty phrases to make the modern and classic man chuckle. 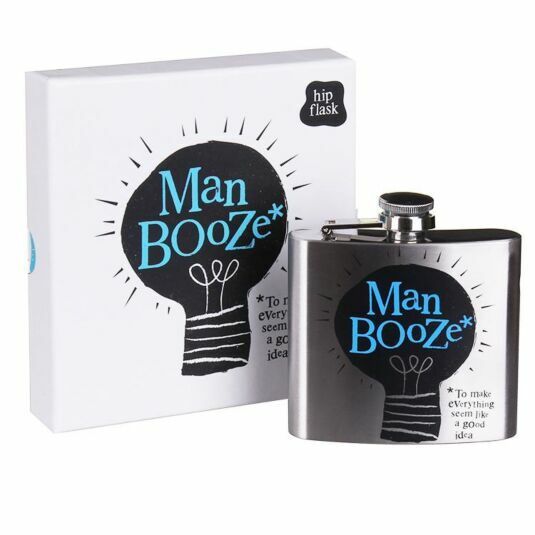 The perfect gift to give to any man, this ‘Man Booze’ Boxed Hip Flask from The Bright Side is great to gift to any father, grandfather, of-age brother or man friend to help them enjoy a cheeky (and safe) tipple be it on a night out, a relaxed night in or on holiday, and great as a Christmas gift! Please drink responsibily and safely.